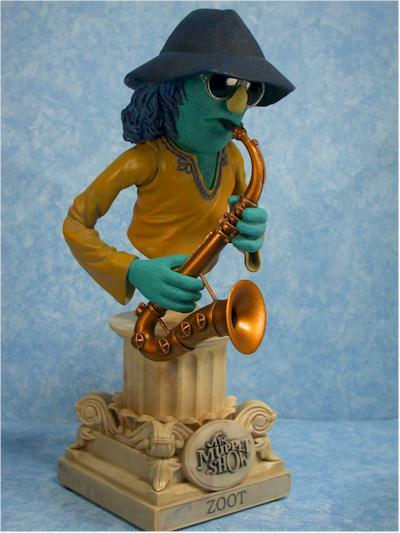 Sideshow is shipping a TON of product this month, and one of the bigger boxes that hit my doorstep was the fourth series in their ultra cool Muppets mini-busts. Calling these 'mini' doesn't do them justice though. They are much larger than any other mini-busts in my collection, towering over lines like the Simpsons or Star Wars from Gentle Giant. This set includes Fozzie Bear, Lew Zealand, Beauregard, and Zoot. The come on the now standard column bases, each numbered and with the signature of the sculptor on the bottom. I've never seen any of these in a bricks and mortar store, but perhaps you have a comic shop near you that carries them. Retail runs from $55 to $60, and you can pick them up at several on-line sites, several of which I have at the end of the review. These boxes match the red velvet curtain style of The Muppet Show packaging. Not only do they hold the busts save and sound, they also have windows in the front that allow you to see the character in all his or her glory. My only problem this time around was with Fozzie - his pointing finger is VERY close to the window. Be careful because it would be easy for the finger to get chipped or the paint rubbed off. Perhaps the best series so far, every bust in this set excels in this category. 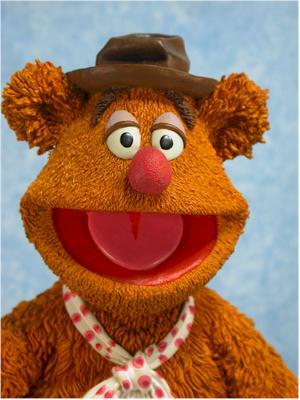 But while they are all exceptional, Fozzie really steals the show. 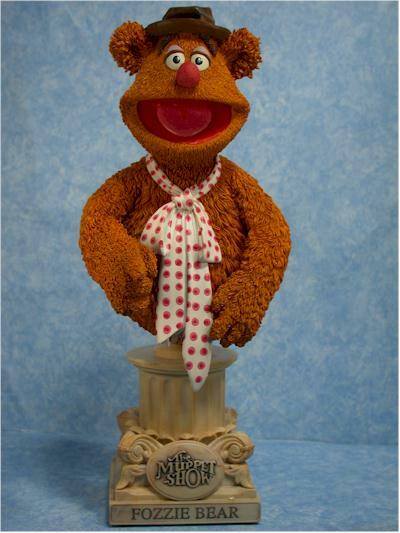 Fozzie fans know that's no surprise! The big bear is just that - BIG! The amount of detail work on his fur and other textures is just amazing. The overal facial and body pose is perfect. It looks like he just told a terrible joke, and 'wokka wokka' is still ringing in your eyes. 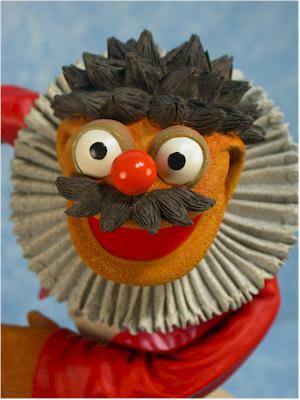 Zoot is nicely done as well, and the use of different texturing for the muppet 'skin', hair and clothing works great here. With Zoot and Janice now, I'm dying for an Animal, Dr. Teeth and Floyd. Thank goodness well be getting two of the three - Animal and Dr. Teeth - in the next series, along with the very crucial Miss Piggy. Lew was never one of my favorite characters, but they've done an admirable job capturing him. The shape of the head seems slightly off to me, but I never paid that much attention to him to be an expert. Last but surprisingly not least is Beauregard. The janitor is not a particular favorite of mine, and I had little excitement over his announcement. 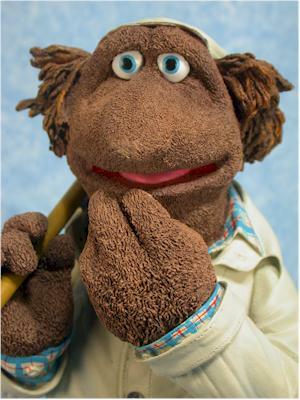 But they've done a fantastic job with him, and he ended up a close second to Fozzie in terms of sculpting and design. The overall paint application on these busts is top quality work. There are a few issues on Zoot and Lew, but the Fozzie and Beauregard I got were perfect. The paint application highlights the extreme detail and various textures extremely well. It works particularly good on the two figures with the heavy nap - Beauregard and Fozzie. There's also some very realistic colors used here for the clothing and plunger, and it makes these two my favorites of the set. 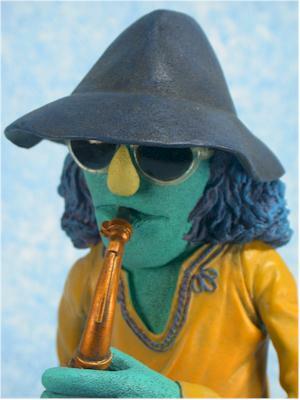 Zoot had a few minor issues, with some of the shirt color showing up on the hands and neck, and a little inconsistency in the color of the face. Lew also showed a few minor inconsistencies across the red, but nothing major or worth getting seriously bent over. Here's where these busts really shine. Everyone of them is in a terrific, appropriate pose, and they look just like you'd expect these characters to. Fozzie and Beauregard are again standouts in this area. Being very large busts, there's a ton of resin here, and some real heft. The facial expresions and body poses work perfectly with the characters. Zoot is playing his horn, natch, and Lew is aout to smack you with a fish. Every design was carefully thought out and well chosen. Ouch. 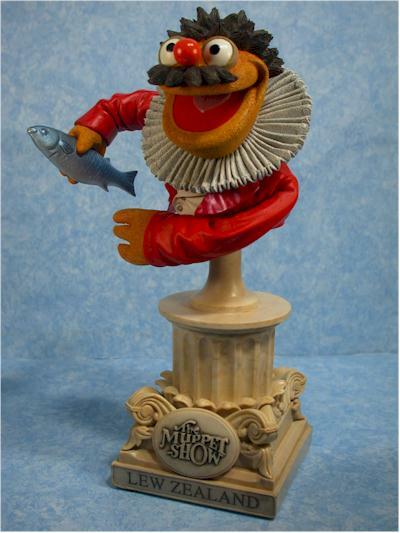 The Muppets busts are going to hurt your pocket more than the average mini-bust, but part of that is because they aren't mini. These are really about twice the size of the Simpsons busts, and all that extra material and heft means you spend more, not to mention the much more complicated sculpting. Still, some of the superhero busts are as complex, and are cheaper by $15 to $20, so there's still some room for improvement in this category. I mentioned on the recent Green Goblin review that I hadn't given any other busts four stars this year. A loyal reader pointed out that wasn't true - I'd given one of the series of the Muppets busts four stars. 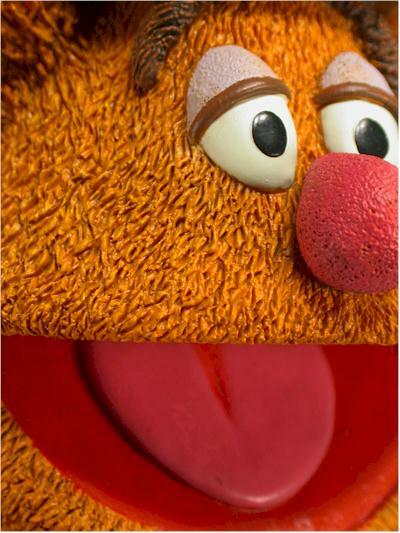 Not only was he right, but this Fozzie certainly deserves four stars in any universe. I just wish these weren't almost painfully expensive. I glance at the shelf of 16 that have been produced so far, and my wallet wimpers at the $800 they represent. 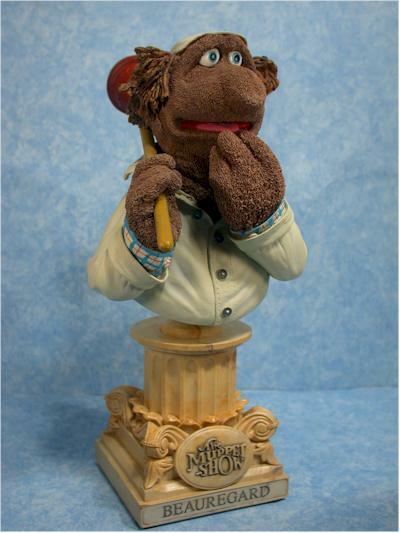 Still, for the avid Muppet collector, these are centerpiece to the collection. - Sideshow has them of course! These are a run of 3000 each, and sell for $55 to $60 at the Sideshow site. If you order all four though, you can save1 15% off that total. They also have pre-orders up for the next series including Miss Piggy and Animal! - Aisle Sniper doesn't have this set listed yet, but they have some of the earlier busts on sale for $38 - $45!